Confession. And please don’t hate me. But I kind of really dislike Mexican food. I don’t even like salsa… Obviously living out in San Diego, this is a crime. We’re just a short trip to Mexico and we are surrounded by amazing Mexican cuisine. Charlie has been so great about being patient with my “pickiness,” but at the same time, he likes to challenge me, a lot. Therefore, I have come to like some Mexican food. Mainly Tostadas. Tostadas are delicious. Who even knew such a delicious thing existed? My first introduction to Tostadas came when we were moving out of our first SD apartment. We were trying to avoid buying food at ALL costs, and more importantly trying to use up all of the food we already had. While we were scrounging around the cupboards we came up with: corn tortillas, beans, rice, and tomatoes. Charlie said “Oh! Let’s make tostadas!” At this point I had no idea what they were, and just deferred to Charlie for cooking that night. 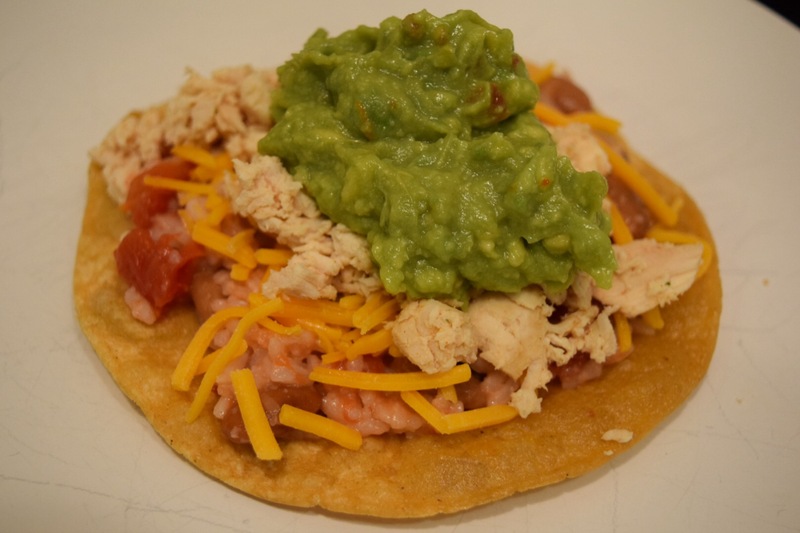 Well, since then tostadas have become a staple in our household – something I even crave. What is so great about these is that you can really make them with just about anything in your cupboard. You can use beef/fish/chicken… anything! The only kind of tedious thing is frying the tortillas. But you can always buy pre-crispy tortillas! These have brought me joy. I am not exaggerating. Real joy. Credit to Whitney for the fantastic photography. Though I did hold a paper bag to serve as a light diffuser. Charlie was so unamused with our photography. The sacred Tapatio. Charlie buys this by the gallon. Set up “stations” and eat while hot! !